The health and appearance of your loved one’s smiles is important to you. You take great pride in promoting proper oral hygiene for healthy teeth and gums. However, they need more than just brushing and flossing. They also need to see their family dentist in Colorado Springs. Unfortunately, this is not always easy because everyone has unique oral health needs. Now, your entire family can benefit from superior dental services from one location. At Anderson Family Dental, we deliver the care they deserve under one roof. Everyone over the age of two needs to see their dentist twice a year for a cleaning and checkup. However, when raising a family, this is not always easy. Children and adults have unique oral health needs that require specialized care. As a result, you often must travel to different dental offices for each person. This adds chaos to your already busy schedule, which can cause you to miss appointments. We offer a simple approach. We will treat your entire family. Now, you do not have to go to different locations as we cater to the individual needs of each patient—no matter their age. 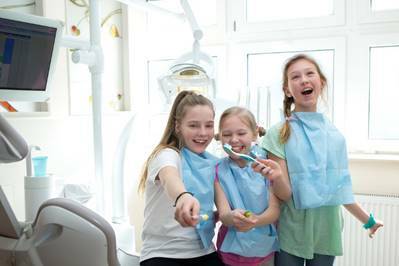 We understand that your young loved ones can be a bit hesitant to visit the dentist because they have different comfort levels. We have families ourselves, including children, so we know the difficulties you face. Due to our personal experience and our vast training, we will make your child feel at ease so they feel comfortable and relaxed during their appointments. We take the time to get to know each member in your family to ensure they receive the high-quality care they deserve. Your family will benefit from complete dental care to accommodate their ever-changing oral health needs. In addition to cleanings and checkups, we also offer restorative and cosmetic services to create generations of healthy, beautiful smiles. In addition, we have specialized areas of services for your older loved ones, such as TMJ therapy to improve their jaw function. To deliver a high standard for care, we embrace the latest technological advancements. With digital x-rays, your family will enjoy a comfortable and safer approach to see areas in the mouth that are not visible to the naked eye. We offer same-day restorations with CEREC because your time is valuable. With state-of-the-art technology and exceptional qualifications, your family will benefit from unsurpassed care. To help keep the cost of our services within your budget, we offer a special dental plan if you do not have insurance. Now, you do not have to delay appointments due to finances. At Anderson Family Dental, we are committed to your family just as we are dedicated to our own. We will treat you and your loved ones with the kind and compassionate care they deserve as their oral health and comfort are our top priority. Benefit from a family-friendly dentist in Colorado Springs. Choose Anderson Family Dental today to create healthy, beautiful smiles for a lifetime. Contact our office to schedule your appointment. We look forward to meeting your family.